This combination of clothes is basically what I usually wear to school. If you're studying in UP, you'll know that wearing comfortable clothes is a must because of long walks from one building to another just to get to your next class on time. For this look, I just used the colors in my polo, and then mixed and matched. 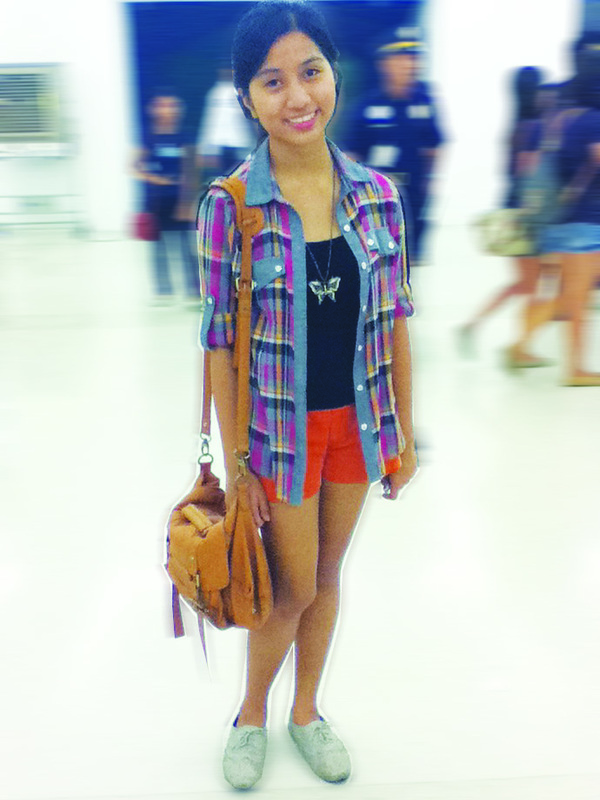 Since my "cover-up" is already printed, I opted to wear plain top and shorts. Maybe someday I'll have the guts to do print-on print? :) I also had classes that day so I had to use something that would fit my notebooks and school-related things, hence my trusted soft satchel bag. I think I already overused that certain bag! And those pair of shoes, don't even get me started. They are actually worn out but I still tried to fix them just to use them when I want to. Tomato and Mint are some of my go-to shops for cheap but good finds, especially when they're on sale!